Modern inventions for flying include this hovercraft that rides like a motorcycle. It's like a Star Wars inspired Imperial Speeder Bike. The Aero-X hovers above the ground at a maximum altitude of 12 feet (3.6 m) and can reach airspeeds of 45 mph (72 kmh). It can carry two people to a maximum load of 310 lbs (140 kgs). Aero-X inventor Mark De Roche, an aerospace engineer and Chief Technology Officer for Aerofex Corporation who manufacture the Aero-X, wasn't trying to create a Star Wars Imperial Speeder. He wanted to create a better all-terrain vehicle. The problem with all-terrain vehicles (ATVs) is that they are not all terrain. You can't go over water, chasms or through swamps. The hover-bike provides search and rescue crews, emergency responders, border patrols, surveyors, farmers, ranchers and other users with an affordable vehicle that combines the benefits of all-terrain vehicles, aircraft and watercraft into one machine. The Aero-X has a kinesthetic control system, which means the vehicle is controlled by leaning against knee and handle bars to steer it sideways, backward or forward. "You can learn to operate it safely in just a weekend of training," says De Roche. Aerofex, based in Manhattan Beach, California is selling the Aero-X for $85,000 for delivery by 2017. Since Leonardo da Vinci's "Codex on the Flight of Birds" wherein he postulated man gliding through the air with bat-like wings, modern inventions in flight have forever sought to realize that dream. Inventor Tony Uragallo of Zephyrhills, Florida has taken a big step in that direction with his invention of Bird Wingsuits. The outfit creates a web of nylon material between outstretched arms and legs. What is unique about the design is that slits in the arms and shoulders allow air to enter into the suit creating an airfoil. This airfoil gives a diver greater control over speed and descent. The standard wingsuit was first invented by French skydiver Patrick DeGayardon and would propel a diver 2 meters forward for every meter downward. But the BirdSuit propels a diver 3.6 meters for every meter downward, which can slow a diver from 80 mph (128 kilometers per hour) to 30 mph (48 kilometers per hour) and glide for a distance of 6 miles (9.6 km). Gary Connery was wearing a special six-pound BirdSuit designed with heavier ribs on the webbing when he set his world record as the first human to jump from a half-a-mile in the sky to the ground without a parachute. The stunt required permission from the British Civil Aviation Authority. According to Tony Uragallo, using his invention requires a lot of skill. A diver needs to practice piloting the suit and using a parachute for landing before attempting what Connery did. Tony will not allow anyone to use his BirdSuit until they have at least 400 jumps under their belt. The 45-year-old Connery began parachuting with the Army when he 23 and has 900 skydive jumps and 450 base jumps to his credit. Before attempting his world record, Connery trained in Uragallo's BirdSuit by jumping from mountains in Switzerland and Italy. He used a parachute to land during these practice jumps. He also studied kite birds to develop his technique. "Kites steer by twisting their tail one way or another," said Connery. The Jetpack is one of those modern inventions that is just so cool. Time magazine listed this innovation among the 50 Best Inventions of 2010. New Zealand inventor Glenn Martin has spent the past 30 years developing his personal flying machine - a dual fan, gas fueled, vertical take-off and landing ultralight. The Martin Jetback is enthusiastically supported by the Research, Science and Technology Ministry of the New Zealand government. In fact, the country has a rich history in aviation innovation dating back to what some historians claim to be the first invention of the airplane by inventor Richard Pearse. The Martin Aircraft Company has completed a joint venture to begin production of the Jetpack. A remote controlled, unmanned model (UAV) has also been developed. It is anticipated that emergency response and rescue organizations, border control agencies, law enforcement agencies and the military will be among the first to order this invention, which should be available by the end of this year. 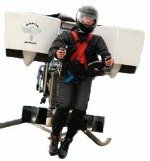 The Jetpack has a maximum flying altitude of 2,438 metres (8,000 feet), a maximum speed of 100 kmh (60 mph), and a flight time of 30 minutes. Fueled by regular gasoline, the Jetpack comes equipped with a ballistic parachute, redundant systems and an impact absorbing undercarriage. This invention is classified as an ultralight aircraft, which doesn't require a pilot license in most countries. However, all owners are required to pass a training program before being allowed to fly the aircraft. Perhaps soon, we'll be watching overhead as commuters fly to work using one of these modern inventions. The price tag is about $100,000.